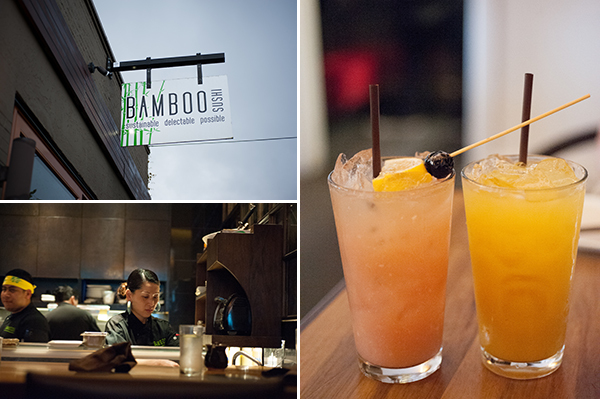 During a search to find someplace to really indulge ourselves on our Portland trip back in April, I came across the admirable video and website of Bamboo Sushi, the first certified and sustainable sushi restaurant in the world. That claim to fame alone was enough to throw me into an excited conniption so it became a "must visit" spot on our itinerary. We managed to get in for an early dinner before the rush started, and the crowds told us just how popular the place was. Then we ordered, and what they brought out made my eyes roll back in my head several times in happiness. My goodness, the sushi here is amazing. Why can't I live nearby? I confess (and Duc would agree) that hands down, this place has the most phenomenal albacore I have ever tasted, and other diners there would agree. "Using the guidelines established by Monterey Bay Aquarium and Blue Ocean Institute, we will never serve seafood that is on their 'avoid' lists. Because we are the first restaurant in America certified as 'chain of custody' by the Marine Stewardship Council, we will always serve as much MSC product as is available. Our MSC product represents exclusively 'best choices' selections." The restaurant is a proud partner of the Marine Stewardship Council, Monterey Bay Aquarium, Blue Ocean Institute, Salmon Nation, KidSafe Seafood, and the Green Restaurant Association and works towards being as sustainable and mindful with sourcing as possible. Guests even get a handy pocket guide of seafood to eat, avoid eating when possible, and definitely not eat based on their sustainability. Bamboo Sushi also aims to get their non-seafood ingredients, including meat, from local, organic, and sustainable sources. We also noted that they are the first sushi restaurant to be a Certified Green Restaurant which indicates best practices for electricity, water, containers, and even food waste via composting. With all of this, how could we not be enamored? We begun with the $5 Signature Mocktails - the Pineapple Express (pineapple puree, passionfruit puree, lemon juice, simple syrup, and dash of lemon bitters) and Lychee Punch (lychee puree, lingonberry, grapefruit, lemon juice, and ginger ale). The pineapple mocktail was pleasantly sweet, and the lychee punch had a fun effervescence from the ginger ale. Both were certainly worth ordering again. 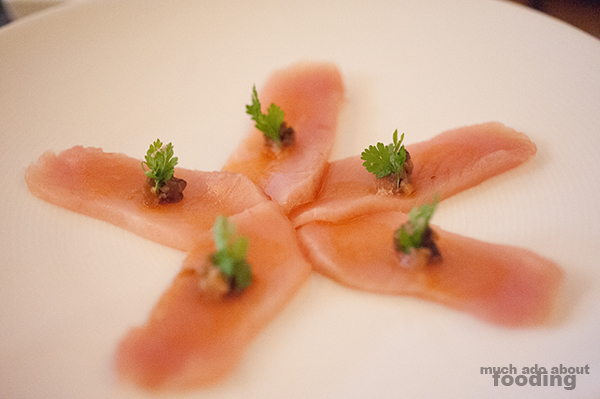 Our first taste of their fish immediately threw the restaurant into our five-star range: MSC Albacore Carpaccio (thinly sliced albacore with chopped house-smoked cippolini onion, pickled Shiitake mushrooms, momiji, ponzu, chervil, and Japanese sea salt). The fish was so absolutely fresh and delicate that the slightest pressure from the chopsticks would sever the pieces; these slices easily melted in my mouth but was brought out of richness by the tang of the topping. If only I could eat this every day. We begun exploring the Nigiri and Sushi (2 pieces) menu with their Inari (fried tofu with rice) and Anago (sea eel - poll caught from Japan). 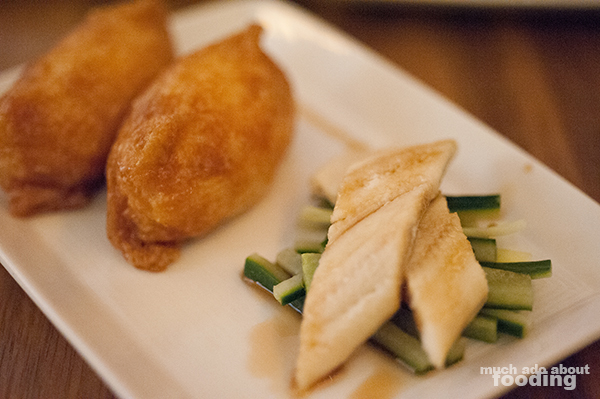 Inari may not be an impressive item in general from any restaurant but this version was the best that I have ever had. The rice was neither mushy nor too dry; it clumped beautifully together with the right amount of seasoning within its savory pillow. The eel was fishier than I had imagined but not because it wasn't fresh - I am referring to how fresh it actually was that I could taste the clean, cooked fish flavor. Considering how bony anago can be, this one was expertly de-boned and substantial. Though we wanted to stay as pure as possible when it came to ordering our sushi as our personal nod to the mission, we just had to see what their rolls were like. We don't typically do rolls but if the fish is any indication of their attention to quality and detail, a roll would be worth looking into. 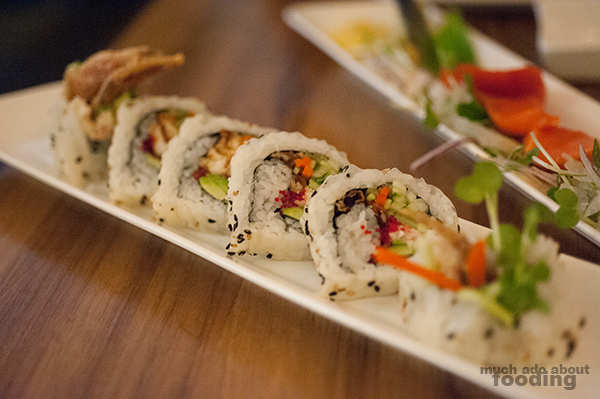 We went with the Spider Roll ($9 - soft shell crab roll), a six-pieced plate of crunchy soft-shelled crab and airy rice. I really enjoyed this but felt that it was the weakest point of the evening. Considering everything was excellent, being the weakest point still makes the roll above average. One thing I liked about their Nigiri and Sushi menu is that most of the items had their source of origin listed next to them. For example, their maguro was noted to have come from the Philippines. 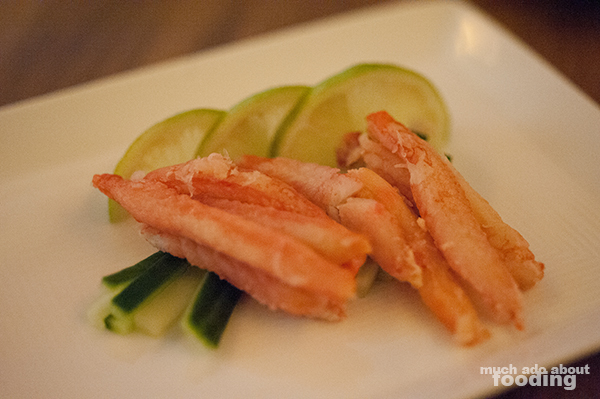 We opted to try some of their MSC East Coast Red Crab which was labeled for the East coast. Flaky, hefty, and cold, the crab was a balance of sea-sweet and sea-salty. 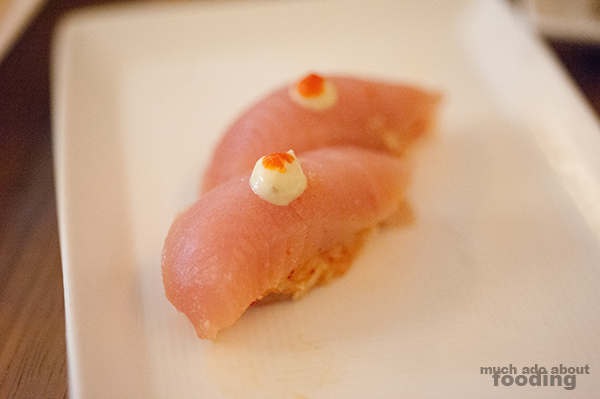 I adored the Albacore Crunchy Nigiri ($7 - albacore atop a mixture of slightly spicy East Coast red crab salad and tempura crunchies) because the albacore alone is exquisite. However, once it was combined in a bite with the red crab salad, the fish was enhanced even more so by the contrast of crunch to melt-in-your-mouth. When a complimentary plate of Seared Kanpachi nigiri (amberjack) came out from the kitchen though, I became worried that we had been spotted. Duc's bulky camera was just about a dead giveaway anyhow. 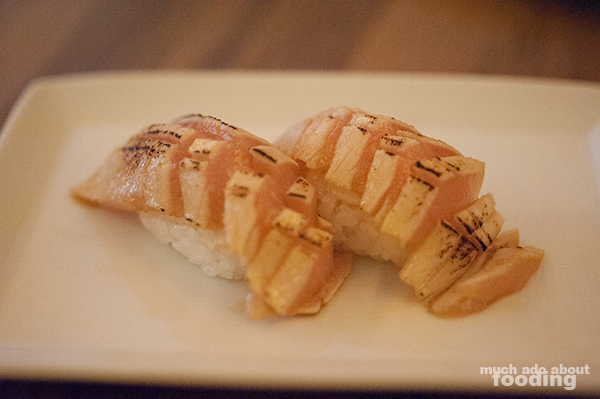 Nevertheless, we graciously accepted this small token and indulged in some seared amberjack which was mild and meaty. The two most exciting parts of the dinner were, however, the Flight of Salmon (a special that evening) and the dessert. The flight contained coho, sockeye, tasmanian ocean trout, Alaskan King salmon, and New Zealand salmons stacked from least buttery to most buttery. Once you laid them out side-by-side, the visual differences were apparent by the color of the salmons' flesh. We started from the least buttery side (so tender that the piece split with contact) and moved on up. 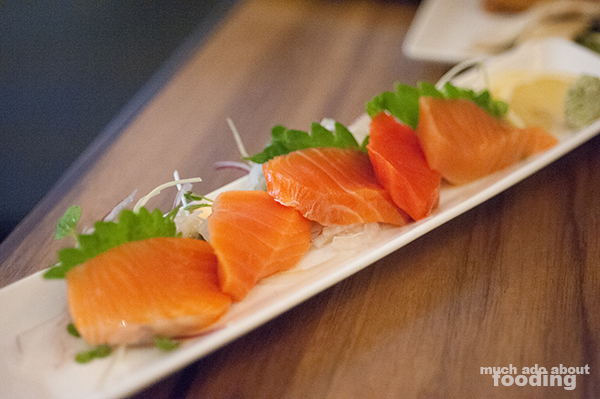 I did not expect pieces of raw salmon to be so widely distinctively but each of these had their own unique flavors and imparted different impressions upon our tongues. 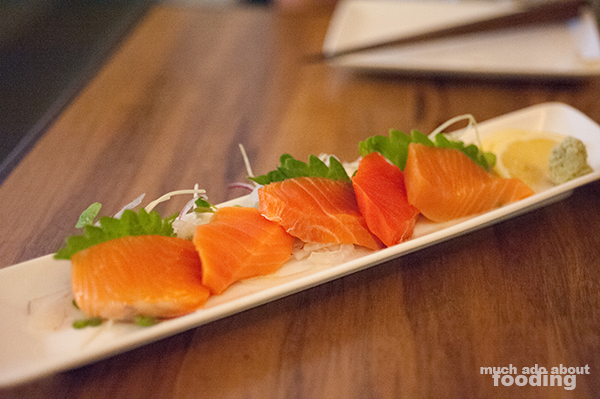 The Tasmanian ocean trout was a strong favorite but all of them were stellar. The dessert was Sea Urchin Crème Brûlée ($8) also known as uni. I had inquired of our waitress how the two came together, and she just smiled and talked about how lovely of a dish it was. My curiosity got the best of me so I had to order it despite our being full. 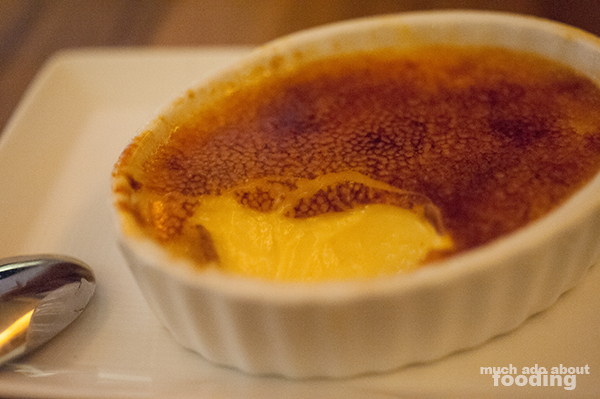 It was rich and creamy, a sweet custard that had a touch of that seawater brininess that seafood contributes. The uni really brought the texture to a new level by thickening the body and hinting at savoriness throughout. This was a treat and one I recommend to finish your sushi experience with. Overall, everything tasted more than five-star worthy but you'll have to check for yourself! There are two locations of Bamboo Sushi, and we were at the second. I've heard that both of them are superb.